As always, the area’s softball season was full of great performances. While Southington is often the program that gets the most attention, and made it the farthest in the CIAC state tournaments, the Blue Knights were not the only ones with great players this year. New Britain, Berlin, Newington, Innovation and Goodwin Tech all reached the postseason this year with several key contributors showing off the depth of talent in the region. As such, our All-Herald Softball Team represents the best of the best not only in the area, but in the state. Southington was among the top contenders in Class LL, and although it fell in the state semifinals, it still finished with a 21-2 record. The Blue Knights landed four players on our team. Kara Zazzaro was one of the most important pieces for Southington. The senior was the ace of the team, continuing a long line of great pitcher from the program. There wasn’t much Zazzaro was not able to do in the pitching circle, and often provided the Blue Knights with clutch performances in big games. Zazzaro got better as the innings wore on, finishing with a 21-2 record and 0.29 ERA with 200 strikeouts in 127.1 innings. She earned all-conference honors. In the fall, Zazzaro will be continuing her athletic career with Iona College. With every good pitcher comes a good catcher and the Blue Knights had just that in Abby Lamson. The junior hit .476 and had 34 RBI, as well as scoring 20 runs. With the season ending in another all-CCC honor for Lamson, she will be looking forward to her final season with the Blues Knights next spring. In the fall of 2020, Lamson will be attending the University of Massachusetts-Amherst, where she will continue to play softball at the Division I level. Senior Frankie Ferrante is also making an appearance on our All-Herald team. The sparkplug of the Blue Knights, the first baseman ended her senior campaign with an all-conference selection as well as All-State. She hit .476 with 26 RBI. She will be off to the University of St. Joseph for softball. Southington junior shortstop Chrissy Marotto had 36 hits, three home runs and 27 RBI from the leadoff position this season. Marotto made all-conference and plans to play softball once she gets to college in 2020. The Redcoats were another team that found plenty of success this season, despite an early exit in state tournament play, finishing 14-7. There were plenty of strong performances that earned Berlin two spots on this year’s All-Herald squad. Senior first baseman Alexa Lanteri was an offensive force for the Redcoats, hitting .388 with one home run and 24 RBI. She also had four doubles and six triples. She was once again an all-CCC selection and received the Coaches Award this year by head coach Jason Pires. In the fall, Lanteri will be attending King’s College in Pennsylvania where she will be enrolled in the physician’s assistant program. Berlin freshman pitcher Stefanie Poulin is making her first appearance on our All-Herald Softball Team. In her first season with the Redcoats, she struck out 125 batters in 120.2 innings, being named all-CCC and all-academic as a result. New Britain softball had a season full of highs and lows, but toward the end of the season, it had its first Class LL tournament win in the last nine years. The Hurricanes place three players on our All-Herald team. All-CCC shortstop Gabby Roy was the Hurricanes’ leader, and despite a season-ending ACL tear toward the end of the season, the senior still made an appearance at every game. Even with the injury, Roy was able to break the New Britain High hits record, collecting her 103rd this season. She has been named all-conference her sophomore, junior and senior seasons and was the valedictorian of her graduating class. In the fall, Roy will be attending the University of Connecticut where she will study nursing. Senior pitcher and utility player Gianna Gonzalez had a 6-1 record and 1.81 ERA. Gonzalez earned the Offensive Player of the Year award after hitting .400, getting an all-CCC selection in the process. Gonzalez is an honors student and earned academic health care and early education cords for graduation. She has been awarded numerous scholarships and will be attending Mitchell College. There, she will be studying elementary education while continuing her love of softball. Joseleen Rivera was another key piece to New Britain’s success. The sophomore earned MVP honors and was named all-conference. She also broke the school record for most strikeouts in a single season, with 113. 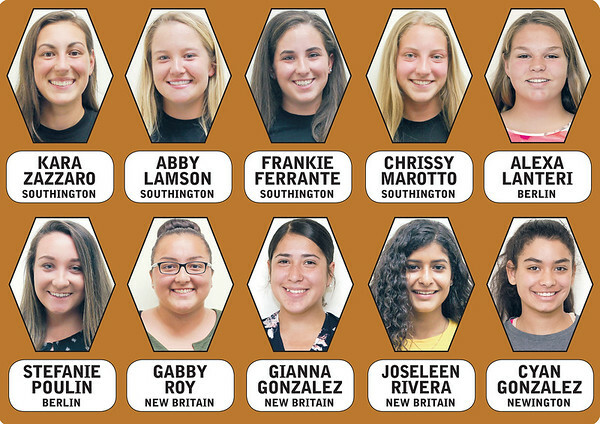 Newington’s Cyan Gonzalez rounds out our All-Herald team. She followed up an outstanding sophomore season with a strong junior campaign, one that earned a second All-State and third all-conference honor. The shortstop led the team in average (.426), hits (26) and on-base percentage (.557). Gonzalez also drove in seven runs, stole eight bases and scored 27 runs, proving she can hurt opponents in a variety of ways. Posted in New Britain Herald, Berlin, Goodwin Tech, Innovation, New Britain, Newington, Plainville, Southington on Friday, 13 July 2018 22:11. Updated: Friday, 13 July 2018 22:14.